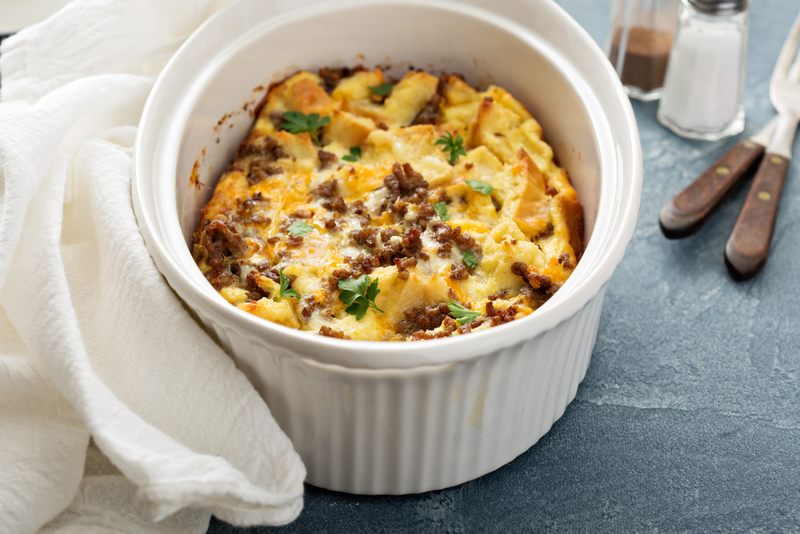 Starting your wintery morning with a savory, delicious breakfast casserole that’s comforting and so easy to make is perfect for you and your family. The one-dish recipe of sausage, eggs, cheese, and biscuits is a real crowd-pleaser and sure to get your appetite going. I am so hungry for this right now! It’s perfect for the cold weather, Sunday mornings, and especially Christmas morning when everyone gathers to eat breakfast before opening their presents. It’s a great way to start the day that will get everyone in the right mood with satisfied bellies! An easy, delicious one-dish breakfast casserole that’s ready in 30 minutes! Everyone will love this deeply comforting and satisfying dish. Line bottom of a greased 9×13 inch baking dish with biscuit dough, firmly pressing to seal. Whisk together eggs, milk, salt and pepper in a medium bowl until blended; pour over the sausage and cheese. Bake 25-30 minutes or until set. Let stand for 5 minutes before cutting into squares and serve warm. Want Another Amazing Casserole? Now Watch How To Make Bacon Cheeseburger Tater Tot Casserole !